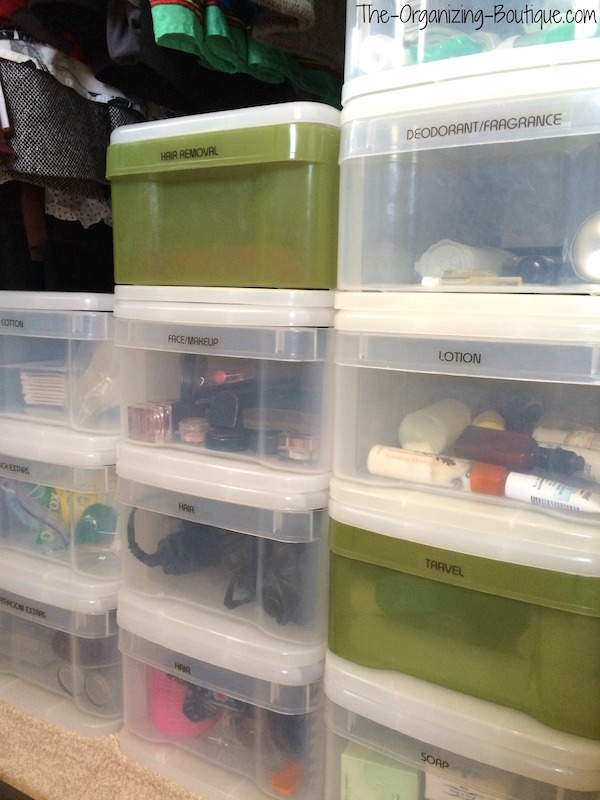 I use plastic organizer drawers all over my own house as well as in my clients' homes. They are among my favorite storage products and with good reason. Clear plastic storage drawers tend to be inexpensive, stackable and durable. They are stupendous for keeping small things orderly like bathroom items. Below you'll find my top 5 reasons for using stackable storage drawers to organize your bathroom stuff along with photos of how I employ them in my own home. Enjoy and happy organizing! With plastic drawers, you can keep your bathroom items organized no matter where they are in your home. As you can see in the below photo, the plastic organizer drawers I use for my bathroom stuff are currently in my closet. Our bathroom is tiny and cannot house all of my stackable storage drawers, so I decided to employ an unused space that's nearby - the bottom of my closet. Whether it's at the bottom of a clothing closet, under a bed, in a linen closet or what have you, utilizing clear plastic storage drawers will keep your bathroom items neat and handy. I mean really easily...like in 5 seconds! Whether I need something as big as my hair straightening iron or as teeny as a barrette, I simply go to the HAIR drawers and reach in for the desired item. It doesn't get any easier than that! Note that my drawers are labeled according to the category of items inside. I highly recommend this. Plus, directing someone else to an item is just as easy. Let's say my husband asks me for some hand lotion. I can effortlessly tell him to look in the plastic drawer at the bottom of my closet labeled "LOTION." And that brings me to number 3. This kind of storage solution means you can tell other members of your home where to retrieve items as well as where to put them away. That means that they can never blame a mess or rogue items out of place on not knowing where they belong. This in turn instills good habits and teaches your family how to be organized. 4. Avoid the black hole of deep drawers or shelves. Often I see clients trying to employ super deep drawers or shelves that require a flashlight in order to see the back. Naturally, small items like bathroom things get lost and jumbled very quickly in such spaces. You can avoid that altogether and keep track of bathroom supplies, large and teeny weeny, with plastic stackable drawers. Also as you can see in the photos, I prefer single plastic drawers that stack (mine are the ones from The Container Store but any plastic storage drawer that stacks should do). This way I can customize the way I stack them to fit any allotted amount of space. This is especially helpful if you move a lot, and that brings me to #5. 5. Moving is a snap. Huh? Yep, you heard me correctly. 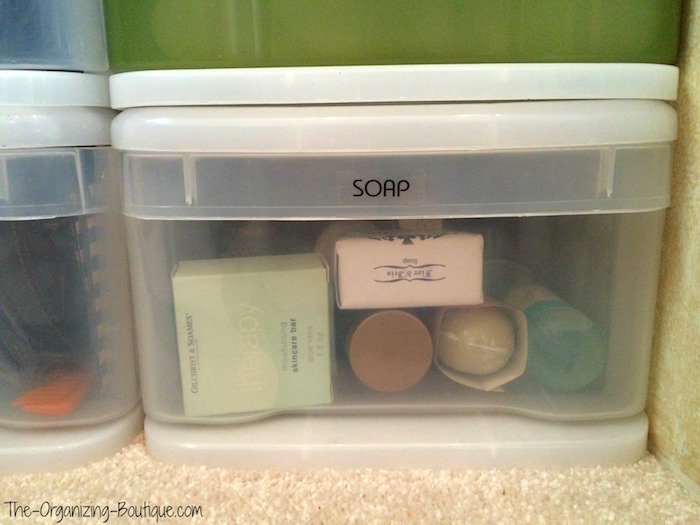 Moving your bathroom items when they are organized in a plastic drawer storage solution like this is SO SIMPLE. These plastic drawers have moved with me 3 times and counting. It is nothing more than packing the drawers into boxes and then unpacking them into your new space. Everything stays organized, and the only thing that needs to be done in the new home is configuring the way the drawers are stacked. Immediate organization - love it! 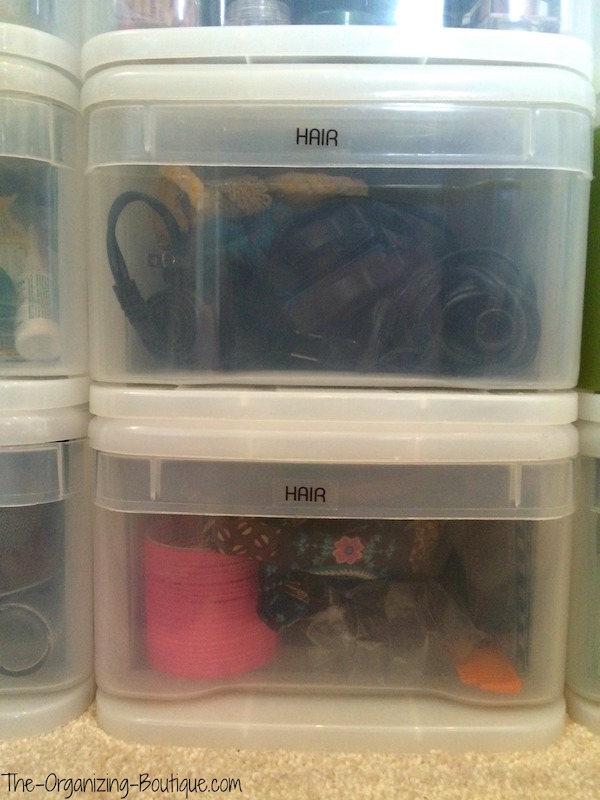 Plastic organizer drawers are among my favorite storage products. Here are some of my other favs!